If you are a member of a group that is typically underrepresented (e.g. if you are not straight, white, cis and male), and otherwise could not afford to travel to IndieWeb Summit on your own, an anonymous donor has established a $1000 fund to assist individuals from underrepresented backgrounds with travel and/or lodging costs for the Indieweb Summit in Portland. For the last two years, I’ve devoured the podcasts from Responsive Day Out—the conference that Jeremy Keith and Clearleft put on across the pond in Brighton. I’ve encouraged anyone who would listen to subscribe to the podcast. It is my favorite conference that I’ve never been to. It seems like just a fortnight ago that I was in the States for An Event Apart Atlanta. Wait a minute …it was just a fortnight ago! It would be utter madness, then, for me to willingly make another trip across the Atlantic so soon after that. And yet, that’s exactly what I did for Indie Web Camp. Now, admittedly, the fact that the event was taking place in Portland may have swayed my decision; it’s a place I’m very fond of, filled as it is with good coffee, a giant bookshop, food carts and excellent geeks most dear to my heart. But the premise of Indie Web Camp also tugged heavily at my heartstrings: the desire to have control over my my own data—living at my own URL—syndicated out to third-party sites …the Pembertonisation of personal publishing. I knew that if I didn’t attend this event, I would just be miserable watching Twitter posts from a timezone eight hours away. So I made the trip from England to the Pacific Northwest to spend two days in the company of some very, very smart people. 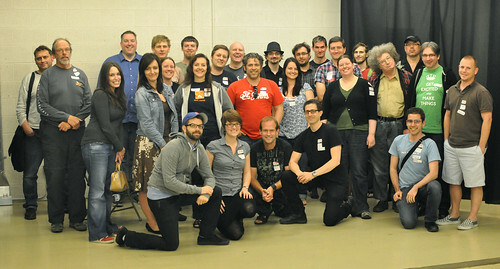 I wasn’t sure whether it was going to be like a Barcamp or more like a hack day. In the end, it was the perfect mixture of both. The first day was spent brainstorming ideas. The second day was spent coding. I feel bad that I didn’t contribute more to the coding side of things (especially after travelling so far to be there) but I did at least take some notes on the demos presented at the end of the event. There were some fascinating themes throughout. Chris spoke about the possibilities of distributed web intents and the possibility of hijacking proprietary actions—such as Facebook’s “like” and Google’s “+1”—through a browser plug-in. On the subject of browser plug-ins, Glenn blew everyone’s minds with a demo of the latest Firefox extension he’s been working on. It more or less turns the browser into an artificially intelligent user agent. I hope there’ll be some documentation forthcoming soon. Ward Cunningham—yes, that Ward Cunningham—spearheaded an initiative for creating a distributed wiki. Meanwhile, a whole bunch of us were concerned about how much pictorial data we are entrusting to Flickr, a service owned by Yahoo; a company with a dreadful track record for preserving personal publishing (Geocities—never forget, never forgive). There was much brainstorming and coding around backing up Flickr photos as well as figuring out ways to post to Flickr from your own website. I should have been contributing to that but instead I was getting some valuable Github advice from Shane on how to contribute to No More Sharecropping. Check out the README file if you’d also like to contribute. All in all, it was a great gathering, ably organised by Tantek, Amber, Aaron and Crystal …well worth the trip. It’s been a starwarsy few days. I made the most of my brief time in Seattle with a visit the Star Wars exhibit at the Pacific Science Center. I took many photos. Needless to say, I loved it, particularly the robot show’n’tell that intermixed fictional droids like C3PO with automata from our own timeline like Kismet. The premise of the exhibition was to essentially treat Star Wars as a work of design fiction. From Seattle, Jessica and I took the train down to Portland. No, it didn’t go under the ocean like the Eurostar, and having WiFi on board a train wasn’t quite as thrilling as having WiFi on a plane, but it was still a lovely journey through some beautiful scenery. Do not pass Go. Do not get groped by the TSA. With 46 microbrew outlets, Portland has more breweries and brewpubs per capita than any other city in the United States. After consuming a few beers in the company of Portland’s finest geeks, we relocated to a true Portland institution: Ground Kontrol. It’s an arcade. But it’s a bar. But it’s an arcade! But it’s a bar! When you get to the trench level on the Death Star, don’t fire; instead dodge and weave to avoid the incoming fire. After about thirty seconds, the music stops. You are now using the Force. If you fire just one single shot into the exhaust port at the end of the trench, you will be rewarded with many, many bonus points.